Who Course is For: Fire fighters, rescue teams, ski patrollers and professional rescuers. This five-day Technical Rope Rescue: Technician Level course meets the requirements for the Technician level for the NFPA 1670 Standard for technical rope incidents, and is the second of three courses necessary to meet that Standard requirement for water. This technical rope rescue training includes low angle, steep angle, vertical training, vertical pick-offs, litter raises and high lines. Our classes are hands on and field oriented. A short classroom session is followed by multiple days of practical field experience. 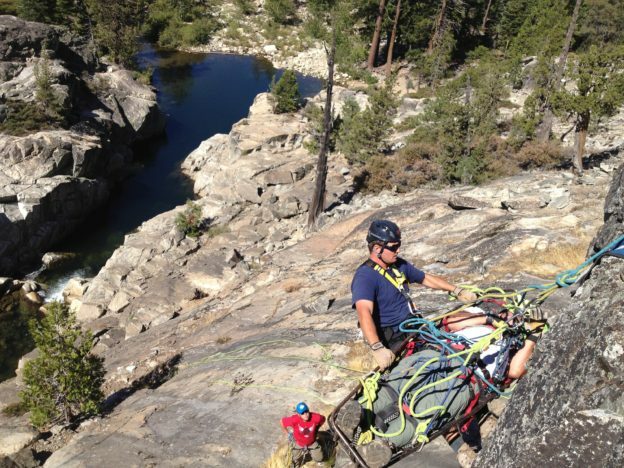 Our field settings are specially selected for their excellent training potential and have made Sierra Rescue the Rescue 3 International Regional Training Center for California.